In large stock pot heat to low. Add olive oil, and diced onions. Soften. Add garlic, celery, carrots. Stir and cook for 3 minutes. Add stock and seasonings. Add shredded chicken if you like. Simmer until veggies are almost cooked through. Add potatoes, and cook until potatoes are almost cooked through. In the mean make matzo ball according to package directions, and place in frig. Once all veggies are cooked taste soup to make sure it's to your liking. Now is the time to add more seasoning. Once Matzo balls are in the pot. No more stirring. Form small balls out of the matzo( they will expand) then drop into soup. Don't stir. They fall apart easily. After 10 minutes gently turn over balls carefully. Cook another 15 minutes and the soup is ready. 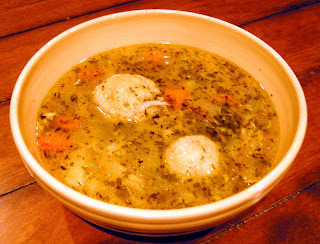 I usually make this soup for the holidays with potatoe pancakes, and a dreidel game. I use the Manischewitz potato pancake mix. Its the best.